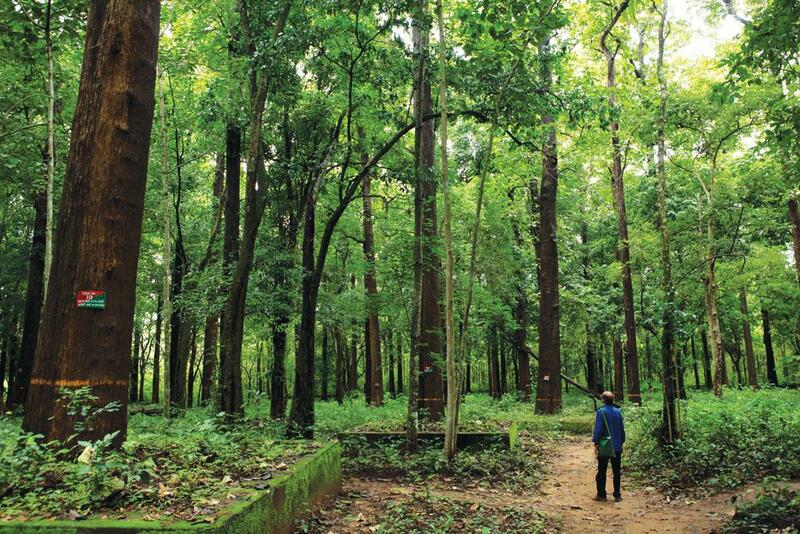 Is it worthwhile to clear forests to annually earn Rs 4,500 per hectare? Another incident was witnessed in the same state in June 2016 when protesters interrupted felling of trees in Gadchiroli district. A protester also filed a case in the Nagpur bench of the state high court. Why does the FDC need such diverse forests for its plantations when thousands of hectares of degraded forests are lying unused?” says Hiramand Garate, the petitioner. The case has now been transferred to the National Green Tribunal. Similar conflicts have been reported from states like Chhattisgarh. FDCS were first set up in the 1970s in several states of the country to improve forest productivity. They function as the production and commercial wings of state forest departments. A total of 19 FDCs are functional now, the rest having closed for financial reasons. For increasing productivity of forests, FDCs have cleared forests to raise high-value timber and pulpwood. To assess FDCS’ claim of having increased the productivity of forests, Delhi-based non-profit Centre for Science and Environment (CSE) analysed their performance using the data provided by them and found fundamental problems in their functioning. With over 1.2 million hectares (mha) of forestland in the possession of FDCs, questions arise as to whether the Union Ministry of Environment, Forest and Climate Change (MoEFCC) should focus on creating new means to enhance forest productivity or on strengthening the prevailing system. This is particularly crucial because the private sector is lobbying to gain control over degraded forests to raise captive plantations. Forest productivity is understood as the rate of production of wood from forests. To maximise production of wood from these lands, FDCs have raised plantations of trees like teak (high-value timber) and eucalyptus (fast-growing pulpwood). In some states, FDCs have also planted cash crops like rubber, cashew and coffee on leased forests. Over 1 mha of forests have been brought under plantations by FDCs across the country. 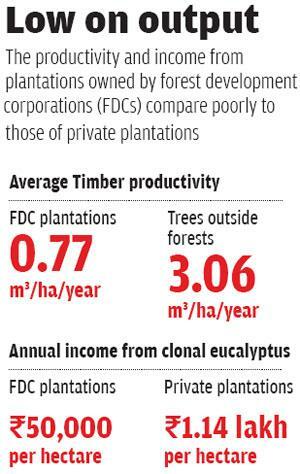 Teak and eucalyptus comprise more than 60 per cent of the total area under FDC plantations. During 2011-15, FDCs produced wood at the rate of 0.77 cubic metres per hectare per year (m3/ha/year). The figure includes timber and pulpwood, but excludes fuel-wood. FDCs might claim that their plantations are performing better than natural forests, where wood production is 0.04 m3/ha/year, but unlike natural forests, FDCs are not supposed to provide conservation and ecological benefits. A fair comparison, therefore, would be one where FDCs are measured against other productive land-use practices such as agroforestry (cultivation of crops and trees on farms) and farm forestry (cultivation of trees). CSE analysis shows that the productivity of FDCs is much lower than that of trees outside forests (ToFs), which include agroforestry and farm forestry. TOFS occupy 14.5 million ha in the country and produce 44.34 million m3 of timber annually. This makes their productivity 3.06 m3/ha/year. What’s worse is that the productivity of FDC lands is even lower than the global average of 0.85 m3/ha/year from mixed and natural forests, as calculated from the Food and Agriculture Organization’s ‘Global Forest Resource Assessment 2010’ report. 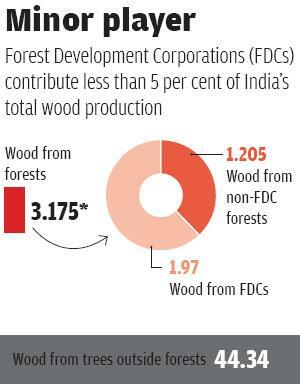 Even when one looks at the overall picture of wood supply in the country, FDCs emerge a small player. CSE analysis shows that the average annual production of wood by FDCs between 2011 and 2015 was 1.97 million m3, which is less than 5 per cent of the total wood produced in India (see ‘Minor player’). Not the entire land in possession of FDCs has been converted into plantations. Some parts are unfit for plantations, or have been used for growing cash crops. FDCs argue that the productivity of the land on which plantations have been raised is higher than the average productivity of the total area under their control. CSE’s analysis finds this claim to be true. But once again, the productivity of FDC plantations is significantly lower than that of individual farmers. For instance, productivity of FDC’s clonal eucalyptus plantations ranges from 4.76-11.69 m3/ha/year in states like Tamil Nadu and Andhra Pradesh. But in Bhadrachalam town of the neighbouring state, Telangana, the productivity of the same species ranges from 32-96 m3/ha/year in plantations owned by farmers. While recommending the establishment of FDCs in 1972, the National Commission on Agriculture had said that “each hectare of forestland should be in a position to yield a net income many times more than what was being obtained”. But this has not happened. Between 2011 to 2015, the average per hectare annual turnover from FDC lands, utilised for commercial plantations, was Rs 4,534.6. This is quite low by all standards. Farm forestry and agro-forestry, which serve the same key objective as FDCs of supplying wood to wood-based industries, provide much higher returns. This is despite the crash in prices of some popular species, such as poplar, in recent years (‘Fall of the poplar’, Down To Earth, 15-31 August, 2016). While cash crops, like sugarcane and rubber, have been providing remunerative returns to farmers, traditional agricultural crops of paddy and wheat also give better economic benefit than FDCs. From eucalyptus (clone 413 variety), for instance, farmers in Gujarat make an average of Rs 1.14 lakh/ha/year, while the revenue to the state FDC is Rs 50,000/ha/year from the same species. FDCs were constituted at a time when forests were governed by the National Forest Policy of 1952, which being a continuation of the colonial legacy, emphasised the “need for sustained supply of timber” and the “need for realization of maximum annual revenue” from forests. The easiest way to fulfil the objectives was to cut down natural forests and replace them with commercial plantations. FDCs adopted the same approach. 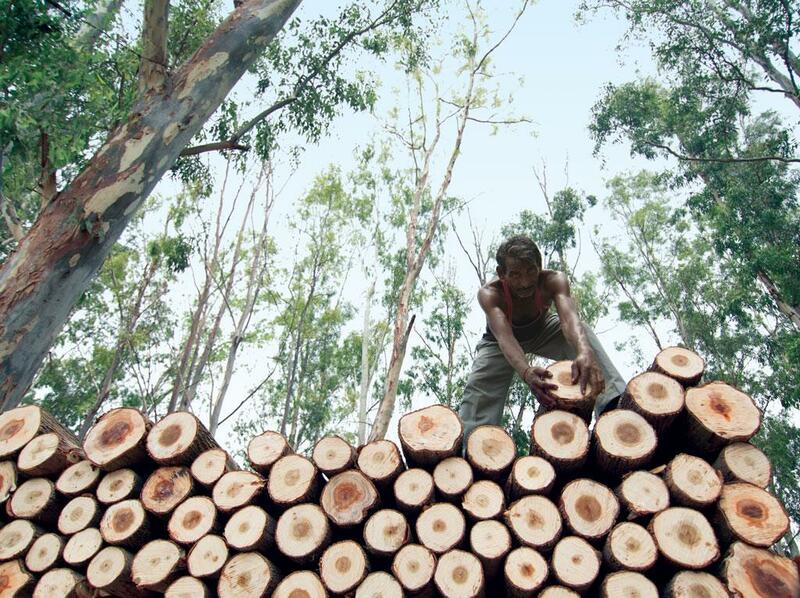 Much of the extensive plantations of teak and eucalyptus were raised through felling of diverse and healthy forests. Maharashtra FDC, for instance, raised teak plantations over 0.13 mha through clear felling of natural forests between 1970 and 1987. The idea was not to improve the production potential of degraded and unproductive forests, but to convert healthy forests into plantations of high economic value. Teak and eucalyptus were raised as monoculture plantations. Teak gets miscellaneous associates naturally after 25–30 years but eucalyptus, when grown in monoculture plantations, is vulnerable to weeds, pests and diseases. For instance, gall infestation affected a certain variety of clonal eucalyptus on a large scale in Andhra Pradesh in 2006. A 1990 report by MoEFCC also mentions that extensive felling and harvesting of industrial crops over two to three rotations result in depletion of soil quality and low humus content. In addition to the above risks , the act of deforestation for raising plantations causes changes in complex forest ecosystems, which cannot be substituted by human-made plantations. Environmental losses include soil erosion, wildlife habitat and biodiversity loss, microclimate changes and adverse impacts on the hydrological cycle. As per calculations by MoEFCC, environmental losses from deforestation in forests with canopy cover less than 40 per cent is more than Rs 1 lakh per ha/year. Contrast this with the Rs 4,534.6 per hectare annual turnover from FDC lands. Even if the plantations compensated some of the environmental losses, they are unlikely to match the ecosystem service benefits. On one hand, FDCs have replaced healthy forests with commercial plantations and on the other hand, they have done little to make degraded forests productive. Rather, they have started to look upon degraded forests as a financial liability. The Madhya Pradesh FDC, for instance, adopted a policy in 2016 as per which it will not take up non-productive forestland for plantations. Another key objective of FDCs was to give “substantial support to the economy of backward areas” and “tribal population which depends on growth of forestry activities”. In 1990, a review of FDCs by MoEFCC noted that “conscientious efforts exclusively for weaker, landless rural populations or tribals” have not been undertaken. Sadly, not much has changed since 1990. Though FDCs provide employment opportunities to local communities by hiring people as wage labourers, and some FDCs even have mechanisms to share benefits, it remains to be studied whether the benefits are actually reaching the targeted population. Take the example of the Gujarat FDC, which is required to share 100 per cent of the profits from the sale of minor forest produce in tribal areas with the gram panchayats. From 2008 to 2015, the corporation should have paid nearly R34 crore, but this has not happened. The Gujarat FDC officials say the decision is pending with the state government for the past eight years. Some activities of FDCs are also in violation of the Scheduled Tribes and Other Traditional Forest Dwellers (Recognition of Forest Rights) Act, 2006. In 2009, the Tripura FDC, which claims to have rehabilitated 2,606 Scheduled Tribes and Scheduled Castes families by providing them one hectare of rubber plantations each, managed to convince the district administration to cancel the forest rights of 43 tribal families over 52.32 ha because the landholders were resisting the collection of latex by the corporation from the rubber plantations for which title deeds had been issued. In October 2013, the Madhya Pradesh FDC organised a workshop to discuss alternate models, like supporting farmers to do farm forestry on barren lands around FDC project areas, or liasioning with the private sector for better investment. These models can be explored. The government can also consider handing over some of the existing FDC plantations to the private sector for better production. Inspired by the success of farm forestry in the state, Andhra Pradesh FDC had attempted soil and water conservation measures in their plantations. While FDC officials claim that the measures achieved higher productivity and fetched better returns, exact estimates are not available. The approach is worth replicating. Given the resentment of communities against the conversion of natural forests into plantations, MoEFCC should introd uce a mandatory social and environment impact assessment system before transferring forestland to FDCs. The focus of FDCs needs to shift to making degraded forests productive. FDCs also have to listen to local communities and not violate the rights granted to them by the Forest Rights Act of 2006. It is evident that FDCs have not fulfilled their objectives and need reforms (‘Planting problems’, Down To Earth, 1-15 November, 2016). During CSE’s interaction, FDCS seemed quite content with their performance, which is a problem because similar land-use practices by farmers yield better results. “FDCs can learn a lot from the practices adopted by farmers. These include better site preparation to ensure removal of root stocks, regular ploughing, selection of productive species and pest and disease management. If FDCs show the same commitment, they can have similar results,” says Harsh Kumar Kulkarni, expert on clonal eucalyptus and former vice-president of ITC Ltd. Therefore, either FDCs should set bench-marks to gauge where they are failing or stop misusing natural forests and acquiring new land. If we do not stop this high rate of cutting of wood than one day nature disappears from our Earth. Thank you Mr. Saxena for bringing vital issues in light. It is responsibility of all to contribute meaningful for our environment.